Does this sound unbelievable? Trust me, I was surprised too. Nestled on a high mountain top with pristine waters of the holy Ganges below, devotees are invited to seek blessings from Neelkanth Mahadev in Rishikesh. Neelkanth Mahadev is none other than Lord Shiva. This name befell on him because of a precarious feat he undertook because he could not see his devotees suffer. The Puranas state that during the churning of the ocean-Samudra Manthan, there came out a poison called-Halahal. The venom was exceptionally powerful that it could annihilate mankind. The gods were distressed and didn’t know how to destroy it. Lord Shiva stepped in and decided to drink it. Mahima (Magnanimous Aura) of Lord Shiva is divine. He surely drank it but did not swallow the poison. He allowed it to remain in his throat. This venom turned his throat blue. Neel defines the color blue, Kanth is throat and Mahadev means Lord of the gods. Lord Shiva came to rest in Rishikesh. The gods tried hard to comfort him and ultimately decided to pour water on his head to cool him off. This is one of the reasons why even today, devotees offer water to Lord Shiva. After several years of rest and meditation, Lord Shiva removed the poison from his throat and left it on a mountain. He returned to his abode, Mount Kailash in the Himalayas. Later a temple was build around this and now stands as symbol of Lord’s grace at a height of 1675 m.
A drive of 32 km. from Rishikesh via Barrage or an alternate route of 22 km. via Ram Jhoola can get you there with ease. The scenic beauty was breathtaking as on one side was the mountain terrain and the other side was a steep drop into the fast flowing Ganges. The holy water of Ganga was much cleaner as compared to the water that flows through Haridwar and Varanasi. The current was tremendous and so river rafting was an extremely popular sport here. Tourists worldwide visit this city for this adventurous thrill. 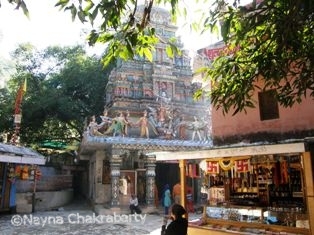 The temple’s car park was lined with stalls selling offerings for the deity. It consisted of coconut, a sealed-plastic glass containing water from the Ganges, Bel leaves, assorted-fresh flowers, fruits like dhatura and jujube, box of incense sticks, small Chunnari (piece of red veil) and a laminated photograph of the Lord Shiva with the backdrop of the temple. As I walked ahead, I was taken aback by the temple’s architecture. The entire Samudra Manthan was depicted with colorful idols of all the gods and goddess. One look at it and the entire Puranic story flashes in front of your eyes. The architecture is extremely well-maintained and the photographs don’t do enough justice to them. Photography is not allowed inside the temple so I was forced to take as much as I could from the outside. I stood in line to enter the inner sanctum. A life-sized idol of goddess Parvati was seated near the entrance. Her striking grandeur forced everyone to bow and offer their obeisance. The arena around the lingam was made of marble. There were detailed etchings of guards or Dwarpals on the columns with intricate detailing that showed their weapons. Opposite the lingam was Lord Shiva’s mount Nandi, the bull. Devotees kept chanting “Om Namah Shivay” and finally it was my turn. I sat in from of the lingam which was encased in silver. It had an opening at the top to see the original form. I poured the water from the Ganges while a priest seated, chanted the Vedic mantras and helped me complete my worship. At the exit of the sanctum, there was a gigantic Pipal tree. Devotees had tied chunnaris to it. I guessed that it was for their wishes that needed to be fulfilled. But I really didn’t have anything to wish for. Getting a darshan like this was more than what I had dreamt of. I feel that if you really want solitude with Lord Shiva, you will get it here in Rishikesh. Even the 12 Jyotirlings won’t give you the solace because of the packed crowds and touts. Jyotirling at Mallikarjun in Sri Sailam, Andhra Pradesh, Mahakaleshwar in Ujjain, Madhya Pradesh, Rameshwaram in Tamil Nadu, Trymbakeshwar in Nasik, Nageshwar near Dwarka and Somnath in Gujarat do not allow always devotees to touch the Lingam. Security concerns, crowd management and arrival of VIP dignitaries can dampen your spirits. I hope my travel experiences give you a clear idea how to get personal one on one time with Lord Shiva.